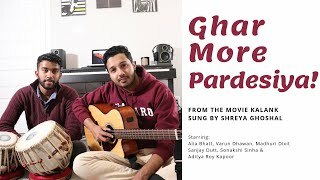 "Ghar Mere Pardesiya" OR "Ghar More Pardesiya" from movie "Kalank". This is my LIVE COVER of the song "Ghar Mere Pardesiya" from "Kalank" along with my friend Videsh Deosaran. This Full Song Cover of "Ghar Mere Pardesiya" was recorded 100% live with no voice or video editing. Let me know in the comments section what you guys think of this live cover of "Ghar More Pardesiya". Music of this song is produced by Pritam and sung by Shreya Ghoshal and Vaishali Mhade.